On Oct. 4, Max Kepler smacked a 3-2 breaking ball from Royals hurler Johnny Cueto to right field for his first Major League hit. That single was a long time coming for the Twins outfield prospect after five vexing seasons. But what perhaps seemed the most trying was the month prior to that memorable knock, when he felt so close to "The Show," but was still 1,000 miles away. As Sept. 1 approached, Kepler hoped he would receive his first callup to Minnesota and his season backed that up. After starting the year with an elbow tweak that kept him in Fort Myers, Florida, the Germany native was finally in Double-A. "I had to battle back from that mentally and physically. And then I had to work myself into the team again, which is tough, coming off the injury," said Kepler, who turns 23 on Wednesday. "When a team breaks together, it's tough when a new guy joins two, three weeks later." MLB.com's No. 44 overall prospect joined Chattanooga in late April, and within a month, he was in the heart of a highly ranked order. Alongside Byron Buxton, Miguel Sano and Jorge Polanco -- the Twins' top hitting prospects at the time -- Kepler led the Southern League with a .416 on-base percentage while slugging .531 and tallying career highs with a .318 average, 71 RBIs and 19 stolen bases across the two levels. With help from hitting coach Chad Allen, Kepler improved in just about every part of his game. "The big thing with Max between Fort Myers and Double-A was I think he just had a little more confidence than he had in Fort Myers. He had some success early when he first got to Chattanooga and he kept it rolling all summer," said Doug Mientkiewicz, who managed Kepler at Class A Advanced in 2014 and Double-A in 2015. "He started believing in what he's doing and the sky's the limit for this kid. He has that kind of ability to be a five-tool player and he has everything you would ever want in a Major Leaguer." "This year he became a man -- he was more mature, he understood the game, he was more comfortable with what he was doing and it definitely showed." But when September rolled around, Kepler was still in the Southern League. "When I didn't get a call Sept. 1, I was a little bummed out that day for a couple hours," the right fielder said. Mientkiewicz had warned a couple of his players that the Twins could be holding off on promotions until after the Lookouts' season was officially over. Such was the case with Kepler. "Knowing that he was a callup and knowing I really couldn't say anything, it was, it was a little... You always want to tell the guys when they're going to the big leagues, it's a moment as a player that you'll never forget," the manager said. Two days later, Kepler was named the Southern League's MVP. But with the Minor League playoffs creeping up, the 6-foot-4 left-handed hitter put the awards, the silent phone and the regular season behind him. "I reminded myself we had the playoffs in front of us. I have to focus on that right now and I'm with a great group of guys and we really have another chance to win that ring," he said. "And once I just forgot about everything else other than the playoffs in front of me, it played out -- when you just focus on the stuff in front of you. And stuff that needs to get done and priorities, then the rest will come on its own." On Sept. 10, Kepler and Chattanooga took on Tyler Goeddel and Montgomery in the first round of the Southern League playoffs. Having the same agent, the Twins prospect and former Rays prospect were already close. They would work out in offseasons together, get dinners on nights their teams competed and eventually lived together in Hermosa Beach, California this past offseason. "He's a hard worker for sure. He takes his baseball really seriously. He's committed to his craft, there's no doubt about it. He's working out as hard as anyone I've ever seen. But at the same time, he's always in a good mood, always fun-loving," Goeddel said. "We had some great times together [in Hermosa Beach], and it's a great friendship. I know it's going to keep getting stronger as we keep playing together and whatnot." In Game 1, Kepler set the tone for the playoffs. The right fielder went hitless in his first three at-bats, but made up for it when it mattered most, slapping a walk-off two-run single in the ninth to give the Lookouts the early series lead. 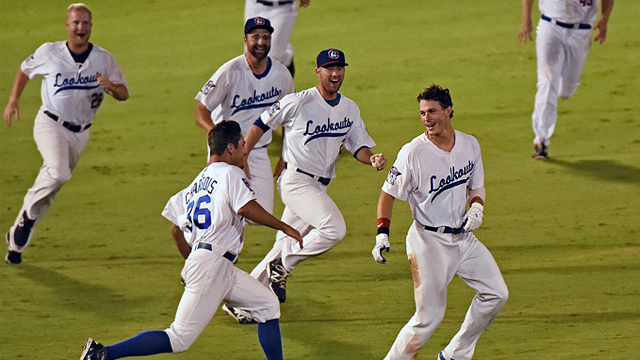 Goeddel gave the Biscuits an exciting finish by scoring the go-ahead run in the 11th inning on Sept 12 to even the series, but in the end it was Kepler and the Lookouts who were celebrating on Montgomery's field two days later. Entering the Championship Series on Sept. 16, Kepler got word that the Brewers were going to call up several of the Biloxi players. As talk swirled around Orlando Arcia and Michael Reed, he couldn't help but think about his own potential callup. "I didn't think about it once, not until then," Kepler said. "But during that series when someone was talking about it, I kind of, a light went on and I started to think about it again." He went hitless in three of the five games. But his performances in the two other contests nailed down the title for Chattanooga. First, Kepler belted two homers and plated five on Sept. 17 to even the series and give his team "a jolt of energy." "In playoff baseball, it's not about how many hits you gets, it's about when you get them," Mientkiewicz said. "Obviously being the MVP of the league, they're not going to give him much to hit. He was ready when they finally did give him something to hit, he did some damage with it." Following two hitless games, Kepler came into decisive Game 5 on Sept. 21 ready to help his team. The Germany native slugged a solo shot in the third to solidify his team's lead en route to the crown. "He kind of just kept playing and just kept doing his thing and doing what he's been doing," Mientkiewicz said. "This year he became a man -- he was more mature, he understood the game, he was more comfortable with what he was doing and it definitely showed." Kepler began celebrating with his teammates in the clubhouse, but shortly after he had to dip away from champagne showers as he was called to the manager's office. Mientkiewicz could finally reveal the Twins' plan for the prospect. "You try to think of something creative to say for each guy, knowing their personalities and where they're from and how long it's taken them, but with Max, I couldn't get it out fast enough," the skipper said. "I congratulated him on his fantastic year [and said,] 'There's only one MVP in the league every year and you're it, congratulations.'" In the room with his manager, hitting coach and Twins director of player development Brad Steil looking back at him, Kepler still wasn't sure what was going on. "I was thinking, 'OK, thanks, congratulations on the great season and the championship' and then Brad gave me the phone with our head guy on it, [general manager] Terry Ryan," Kepler said. "Honestly, I don't remember much of it, but I just remember I was tearing up and the first thing I wanted to do when I heard the good news was call my family, let them know." Mientkiewicz also found himself overcome with emotion. "It's like one of your own kids getting a chance to fulfill a dream and it's pretty exciting," the manager said. Even with the time change, Kepler's parents were still awake in Germany and quickly began looking at flights to see their son's Major League debut. That night was a mix of celebration, phone calls, tears and packing, leaving about two hours for Kepler to sleep. "I really wanted to join my teammates who were downtown celebrating. I couldn't really partake much in the celebration, because I had to get on a plane a couple hours later," he said. "The first game in Minnesota was tough staying awake, but just seeing the stadium and stuff, it gave me an adrenaline rush and got me through the whole day with a smile on my face." But groggy Kepler was finally a Major Leaguer. Joe Mauer was his "locker buddy," Torii Hunter became his mentor and his former teammates served as his guides. "All the rookies up there took me under their wings too and just showed me how everything works, what not to do, just to stay quiet in the clubhouse otherwise veterans will get on you," he said. Like Mientkiewicz warned him, Kepler was told by big league manager Paul Moliter that finding playing time would be tough while the Twins were fighting for a postseason spot, so Kepler just stayed ready. On Sept. 27, Kepler pinch-hit for Hunter, going 0-for-1. "The field looked a lot bigger from the bench than it did when you were standing in right, but it sure didn't seem as loud on the bench as it did when you were on the field," he said. "I had the jitters the whole entire time and don't think I've ever been as jittery on a baseball field as I was that day. I just remember making the last putout and I was very anxious not to drop the ball." On the final day of the month, Kepler got another opportunity to pinch-hit for the five-time All-Star, but came up empty again. "I had the same exact jitters that I had the first day. I think it's more of a pinch-hitting deal for me that supplies the jitters than it is easing your way up in the big leagues, because you're cold coming right off the bench," Kepler said. "But just the fact that I had to replace Torii Hunter -- ya know, a Gold Glove outfielder -- is reason enough to have a lot of nervous energy." Kepler went on to collect his first Major League hit a couple days later in his third game and will likely get the opportunity to follow with many more "firsts" with Minnesota at some point this season. But even when he nears his "lasts," he'll always have that September to reflect on. "If I'm every struggling in my career, I'll probably look back to that month and think of all the positivity that can come out of baseball," he said. "Baseball comes with so much failure and negativity. I like to look back on past memories where I've had success if I'm struggling and that will probably be one that I'll take out of the bunch to motivate me."